Socialist candidate François Hollande, who is currently leading the presidential race in the polls, demonstrates a strong presence on the web, thanks to his online team. For the campaign, François Hollande’s team “decided to impose itself on the web an utilize the most pertinent tools to diffuse the messages of the candidate and of his team, mobilize the electorate, and provide information on events and news. This campaign is based on four rules: virality, transparency, swiftness and accessibility. The campaign began in October 2011, right after Hollande’s win in the two-round Socialist primary elections. TousHollande.fr is not a new website, it’s the updated version of another support page for François Hollande that was created during the Socialist primary and that was “semi-official.”. At the time, the website aggregated blogs and tweets of supporters, but it was less known and less structured. Today, FrancoisHollande.fr is devoted to the declaration of the candidate, not to create confusion with the message. TousHollande.fr is aimed at all activists in a broader sense, not just to members of the Socialist Party. Toushollande.fr is the campaign website for Socialist candidate Francois Hollande. Meanwhile, FrancoisHollande.fr is 100% focused on François Hollande the man and candidate. Users will find his biography and his proposed plan, known as “The 60 Commitments of François Hollande.” The site also contains more of the day-to-day news of his activities, such as the places he might visit and details of his speeches. There is a lot of multimedia content, especially videos. Users can also make donations here, and of course, also access the campaign site. Francoishollande.fr is the support page for Socialist presidential candidate François Hollande. It is in this site that Hollande’s web campaign is clearly outlined. By clicking ont the tab “Outils Web” (Web Tools), visitors can find the complete list of the candidate’s sites, which is definitely very helpful as it allows access to Hollande’s networks and online channels in a sort of one-stop-shop. The list is introduced with the phrase: “Follow the latest of François Hollande’s campaign” and contains links to all his social media accounts. A partial list of Francois Hollande's networks and online tools as they appear of his website Francoishollande.fr . The masterminds behind Hollande’s web campaign team are Fleur Pellerin, Hollande’s digital adviser and Vincent Feltesse, who is directly in charge of managing the candidate’s online campaign. But there are hundreds of volunteers working for the candidate in front of their computer screens, making sure Hollande’s message gets across as many people as possible through the web. Francois Hollande's web campaign team. 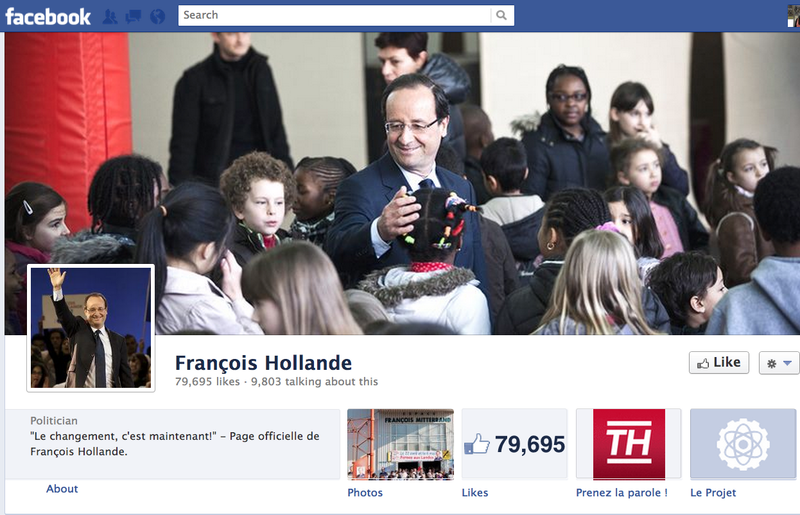 We will take a deep look at Hollande’s social media strategy in a future post. Until then, have a great week!